Why it’s daunting: While much of the focus on music of the ’90s dealt with the emergence of grunge and the larger “alternative” movement, a sprawling collective of psychedelic pop bands and side projects was spawned from the friendship of four high-school buddies. When Bill Doss, Will Cullen Hart, Jeff Mangum, and Robert Schneider befriended one another and began trading tapes during high school in Ruston, Louisiana, none could foresee that they’d eventually be the roots of a label/collective that began with three bands and grew to encompass several dozen acts. Besides the extended family tree, the geographical spread (two unofficial bases in Denver, Colorado, and Athens, Georgia, but bands scattered from San Francisco to Brooklyn) and the labyrinthine nature of the loose member overlap among the collective’s many bands and even more numerous side-projects also makes the collective a tricky one to trace. Contributing to the difficult nature of delving into the music of the Elephant 6: The definition of what, exactly, the Elephant 6 is. Even the band’s official website answers its own question, “A collective, a label … a cult?” with purposeful obfuscation: “Elephant 6 may be all of these things or none of these depending on your point of view. And we’re certainly not going to try to define what it is now!” The collective’s life as a label began via Schneider upon the 1993 release of The Apples In Stereo EP Tidal Wave, followed by albums from its core members and their spin-offs. The label itself was short-lived, though, operating just six years; its last release was the The Minders’ Cul-De-Sacs And Dead Ends in 1999. But as a loose collective, the Elephant 6 lives on despite many of its bands splitting off, branching out, breaking up, or moving on to other labels. The collective’s confusing nature is also due to a self-created mystique, whether through active pranks (a group of members convinced a Rolling Stone writer they all lived together in a commune) or through willful ambiguity (the aforementioned definition, or lack thereof). But there’s been a resurgence of late, as the logo of the defunct label has sprouted up on releases from members over the last few years, and once-dead bands like Olivia Tremor Control are being resurrected. There have even been a few incarnations of the “Elephant 6 Holiday Surprise Tour” in recent years, featuring more than a dozen members from many of the collective’s bands. Perhaps the most telling sign of the collective’s apparent rebirth, though, is the recent tour from its famously hermetic co-founder Mangum, where the collective lives on in the form of the logo that appears on Mangum’s merchandise. Why: In The Aereoplane Over The Sea is the culmination of everything the E6 collective was about in the mid-’90s: distinctive, ragged, catchy records ripped straight from their makers’ veins. On Neutral Milk Hotel’s debut album On Avery Island, Jeff Mangum and his vagabond psychedelicists sounded like they were huddled in a shelter, having one last jam before the bomb dropped; on 1998’s In The Aeroplane Over The Sea, Mangum and company played with less panic, but still with telltale urgency. (The air raid may have been over, but radiation was still seeping into the groundwater.) Practically every song on In The Aeroplane fits the same pattern: rapidly strummed guitar, bellowed vocals, surreal lyrics, heavy distortion, and flourishes of mariachi horns, all in keeping with the E6ers’ belief that rock achieved perfection during The Summer Of Love, and all that remained was to work variations on a handful of retro themes. But from Mangum’s divine visions to his multiple references to Anne Frank to Robert Schneider’s production—which pushes the levels so far into the red that the music becomes a little terrifying—In The Aeroplane Over The Sea has such a deeply personal intensity that it stands outside both the era that spawned it and the era that inspired it. Throughout, Magnum comes off like an inspired street crazy, yet he also has moments of clarity and beauty. The haunting shout of “I love you, Jesus Christ!” on “The King Of Carrot Flowers Pts. Two & Three,” the hyper-drive narrative force of “Holland, 1945,” and the chilling entirety of “Ghost”—a campfire round that advances into a cacophonous quick-step march—all speak to an imagination that can convert nostalgic sounds and psychotic visions into a fascinating worldview. This album has a fervor about it, and it made the entire E6 bunch seem less like fannish dilettantes and more like major players. Next steps: The first band to put out an official release on the label, The Apples In Stereo formed around Robert Schneider in Denver in the early ’90s, drawing heavily on the psychedelic pop elements of The Beatles and Beach Boys. The band’s early work like Fun Trick Noisemaker (1995) and Tone Soul Evolution (1997) feature a wall-of-sound approach Schneider took from Phil Spector and Brian Wilson. But 1999’s The Discovery Of A World Inside The Moone took a rawer path, ditching the wall of guitars in an attempt to replicate the band’s live sound; the resulting LP still remains the band’s best. Album opener “Go” fills the space with horns and flute, creating a perfectly layered tapestry woven together with the backing vocals to underscore Schneider’s melody. “I Can’t Believe” is a spacey rocker that buzzes with intertwined electric guitar and woozy synths. And the band even dabbles in R&B on “The Bird That You Can’t See,” a stomper built on top of a Parliament-like groove. Presently, Schneider is the lone original band member left, and recent albums, like 2010’s Travellers In Space And Time, find the band exploring a sound more akin to ELO. From the Apples extend numerous side projects, perhaps more than any other band in the collective. Von Hemmling is a more experimental pop project from Apples founding bassist Jim McIntyre, a band he had started before Schneider recruited his skills for the Apples. The band had two releases on the E6 label before moving on to other labels and self-releasing material. Schneider himself had several side projects, some of which will be covered later. Marbles was a solo effort that gave Schneider the opportunity to be a bit more out-there, appearing on stage in goggles and a cape to belt out jittery, synth-based pop tunes. Most of Marbles’ releases were cassette-only, but spinArt put out the woozy Expo in 2005. Finally, it’s worth noting the fun Robert Bobbert And The Bubble Machine, essentially the Apples In Stereo reincarnated for kids. If In The Aeroplane Over The Sea had never existed, Olivia Tremor Control’s 1996 record Music From The Unrealized Film Script, Dusk At Cubist Castle would likely be considered the defining LP of the first E6 wave. It’s not just that Dusk At Cubist Castle featured contributions from Schneider, Mangum, and Music Tapes/Neutral Milk Hotel multi-instrumentalist Julian Koster, which made it as much of a group project as any album under the E6 name; but the album is also an album, not some collection of disconnected songs and studio wankery. OTC Co-leaders Bill Doss and W. Cullen Hart—working closely with drummer Eric Harris and bassist John Fernandes—emphasize the “trip” aspect of E6’s basement psychedelia, adding layers of often-mysterious sound, and alternating trippy noise-pop tunes with short sonic experiments to create a feeling of being transported. Whenever the band touches down long enough to play a song like the buoyantly Beatle-esque “Jumping Fences,” the cohesion of the voices and instruments is all the more remarkable, given that mere seconds before, these musicians were flailing away on anything that can be blown into, strummed, or banged upon. The band’s 1999 follow-up, Black Foliage: Animation Music Volume One, contains just as many memorable songs, but also more experimentation. While Cubist Castle’s freeform excursions deliver contextual atmosphere, Black Foliage tilts the screwing-around-to-song ratio too far toward the former. Olivia Tremor Control split soon afterward, though Doss and Hart have been playing together again lately, with talk of another album. In the meantime, Doss and Hart have kept busy helming their own side projects. Doss’ The Sunshine Fix resembles Olivia Tremor Control, except that many of the deliberately obscure sonic filters have been removed. The Sunshine Fix’s tuneful 2002 LP Age Of The Sun does contain some brief, weird instrumental tracks, but only to provide the record with a cohesive melodic theme. The Sunshine Fix leans far more heavily on well-lit rock songs with memorable hooks and imaginatively dreamy instrumentation. Hart’s Circulatory System hews even closer to OTC’s cracked psychedelia, which makes sense, since OTC members Harris, Fernandes, and Peter Erchick followed Hart to the new group. But even Circulatory System is more overtly song-oriented than Black Foliage, as evidenced by tracks like “Yesterday’s World” (from the band’s self-titled 2001 debut), which puts all the usual OTC-style fuzz aside in service of a shout-along lyric and a deep rock kick. As for the other OTC side projects that have popped up over the past decade-plus, Erchick’s band Pipes You See, Pipes You Don’t is proof that a trippy sound alone can’t compensate for weak songs; ditto the lone album by the anonymous Frosted Ambassador, which is rumored to be Harris’ brainchild. Elf Power’s subsequent releases appeared on a variety of labels (spinArt, Orange Twin) and saw the band continuing to tinker with its sound even as it opened for the likes of Wilco and R.E.M; the 2003 album Walking With The Beggar Boys, for instance, features a streamlined, more focused pop sound. The band still lives on, releasing a gentle, polished self-titled album in 2010. Meanwhile, Rieger and Carter were part of a trio (alongside The Gerbils’ Scott Spillane) that opened for Jeff Mangum on his recent solo tour. At this point, Kevin Barnes’ band Of Montreal has been around so long and has gone through so many changes that it seems too confining to tag the band as an E6 act, even though Barnes—not part of the original Ruston circle—defined the look, sound, and subject matter of E6 as much as the guys in Olivia Tremor Control or The Apples In Stereo. Of Montreal’s best albums have come over the past five or six years, as Barnes has embraced glam-rock and disco—very un-E6-y, those genres—but in the early days, Of Montreal was more deliriously crackpot, like a more chipper twist on Neutral Milk Hotel. A song on the band’s debut, Cherry Peel, best sums up Barnes’ early sensibility: “Tim, I Wish You Were Born a Girl” (so that he could kiss his best friend, of course). The Gay Parade—the best early Of Montreal album—offers a series of story-songs set to bouncy piano and folk guitar, like a slightly skewed dance-hall revue, or 16 variations on The Beatles’ “Yellow Submarine.” Most of the stories are about eccentric characters like the “Fun Loving Nun,” or “The Miniature Philosopher,” but there are also sketches of more mundane folks, like shy volunteer fireman “Jacques Lamure,” or the wistful, sentimental “The Autobiographical Grandpa.” (And it all ends with “The Gay Parade Outro,” wherein Of Montreal thanks us for listening to the record, and invites us to listen again whenever we want to visit their wonderland.) Back then, Barnes claimed his primary influence as The Kinks, but his kid-show-host instincts also betrayed a touch of Tom T. Hall and The Bugaboos. Both Of Montreal and Elf Power have employed Bryan Poole—a.k.a. Bryan Helium, a.k.a. The Late BP Helium—a broad-minded alt-rock enthusiast as capable of playing roaring country-rock as channeling Robyn Hitchcock, XTC, or George Harrison. (That versatility has stood him well as Of Montreal has changed styles over the years.) The Late BP Helium’s first full-length solo album, Amok, shows off Poole’s eclecticism right from the start, with “Belief System Derailment Scenario,” a horn-fueled rock vamp that begins as krautrock, veers into an extended freeform jam, then lands safely back in the pocket. On the tracks that follow, The Late BP Helium tugs gently at avant-garde folk-rock and thrift-shop psychedelia, finding comfortable places to nestle. Spun out from Chocolate USA (which featured fellow OTC collaborators Bill Doss and Eric Harris among its many members), Julian Koster’s project The Music Tapes is one of the most experimental of the collective’s bands. Koster utilized sound collage as well as less conventional instruments on his early efforts, 1st Imaginary Symphony For Nomad and The 2nd Imaginary Symphony For Cloudmaking. Dusty, scratchy vocals swoon over clattering piano, banjo, and the singing saw, creating an eerie atmosphere that lends itself well to some of the mystery surrounding aspects of the collective. 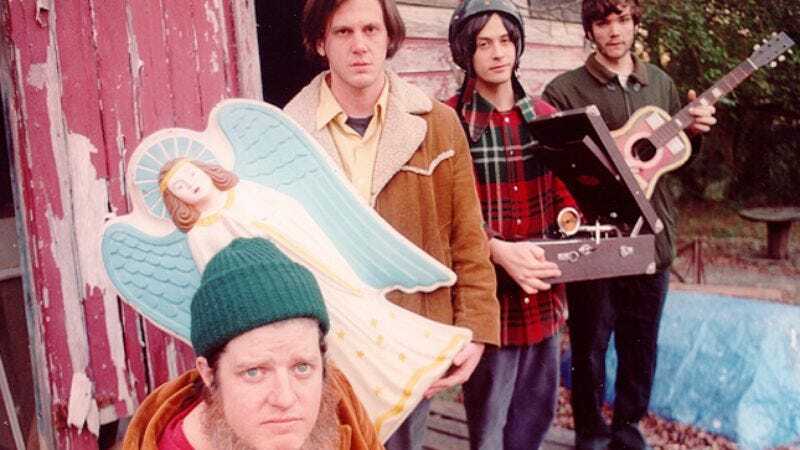 Composed of primarily sketches rather than full songs, these albums still hint at the typical E6 sound, particularly the loose folk of Neutral Milk Hotel. After a six-year break, the band put out Music Tapes For Clouds And Tornadoes in 2008 and Purim’s Shadows: The Dark Tours The World in 2011, both on Merge. While the basic experimental sound tenets remain, there is a slight shift in focus to more organized song structure. The band currently includes Harris (who also plays with Elf Power) and Laura Carter (Neutral Milk Hotel, The Gerbils, and Elf Power). From his home base in Denver, Robert Schneider has connected with more than a couple of like-minded souls to take the place of his far-flung Ruston pals. One of those fellow travelers is Martyn Leaper, whose band The Minders was briefly one of the hottest acts under the E6 umbrella, thanks to their 1998 spinArt debut LP Hooray For Tuesday. Like a more straightforward Apples In Stereo, The Minders made buzzy, guitar-driven indie-pop with sharp hooks and just enough of the musty redolence of the practice space to fit with the E6 aesthetic. For a time, The Minders featured singer/guitarist Tammy Ealom, but she left early on to form her own band Dressy Bessy, which became a cornerstone of the Kindercore label with the release of 1999’s well-received Pink Hearts Yellow Moons. Mixing E6-style garage-pop with the some of the serrated edge of the riot grrrl movement—musically if not politically—Dressy Bessy was all about a strong beat and singsong melodies, gibing with the Apples and The Minders in terms of their shared willingness to be fun and entertaining. Formed in the mid-’90s in San Francisco by Miles Kurosky and Bill Swan, Beulah earned Schneider’s attention early on, and subsequently, the band’s first single and debut LP, Handsome Western States, were released on the E6 label in 1997. It’s easy to hear what drew Schneider to the band; States sounds like a more ramshackle, stripped-down version of the Apples, complete with Beatles homage (the handclap-punctuated “I Love John, She Loves Paul”). The band’s best album, When Your Heartstrings Break, wasn’t an E6 release—States was the band’s only release on the label—but the band remained within the collective’s orbit. On Heartstrings, Kurosky added layers aplenty, heaping strings and horns on top of Beach Boys-inspired melodies, like on the rollicking “Ballad Of The Lonely Argonaut” and the album’s gorgeous closer, “If We Can Land A Man On The Moon, Surely I Can Win Your Heart.” The album’s peak, though, comes on the panoramic epic “Emma Blowgun’s Last Stand,” a song that slowly burbles to life, a beautiful, gliding instrumental that kicks into a higher gear when the vocals come in at the halfway mark. The band’s following albums, The Coast Is Never Clear and Yoko, delved into darker territory lyrically even as the sunny sound remained, a result of Kurosky’s personal turmoil, which led to the band’s split in 2004. Kurosky and other former members of the band have since played together in Kurosky’s solo effort, Desert Of Shallow Effects, which is rooted more in indie folk than buzzy Beatles-esque pop. Schneider’s E6 empire extended to Brooklyn after he gave the nod of approval to The Ladybug Transistor and The Essex Green, a couple of bands working in tandem out of Ladybug Transistor frontman Gary Olson’s home studio, Marlborough Farms. The Essex Green’s most E6-y album is 1999’s lovely Everything Is Green (released by Kindercore Records), which is a polished homage to the trippier and folkier sides of late-’60s sunshine-pop. As with Of Montreal, The Essex Green later evolved beyond its influences on albums like 2003’s The Long Goodbye and 2006’s Cannibal Sea, both of which take some weird chances, mashing up The Beatles, Blondie, and The B-52s on one track and then working a mad-scientist mutation of country music and pastoral pop on the next. The Essex Green has been silent for a while—perhaps because the band knows it’ll be hard to top Cannibal Sea’s magnificent “This Isn’t Farmlife,” a peppy, fruggy, frosted pop-cake that drifts away at the halfway point and then comes back strong, draped in pretty strings. The Ladybug Transistor has stayed more active, though after moving on from its early kitchen-sink indie rock to a more sophisticated hybrid of ’60s psych-pop and ’80s new wave, the band has more or less stayed married to that style for album after album. That’s worked out okay, though; last year’s elegiac Clutching Stems is as good as anything Olson and company have recorded. Like The Essex Green, The Ladybug Transistor has always been a little slicker than most bands that have borne the E6 stamp (however briefly), but the 1999 LP The Albemarle Sound fits well with the ideals of the collective, employing brass, strings, and woodwinds in ever-more-free-form arrangements, often with a jazzy abandon that’s rare in meticulously studio-crafted pop. The band works with the odd time signatures and affectless harmonies that fueled the post-Revolver baroque rock of the late ’60s, while Olson’s lyrics show the kind of preoccupation with aimless summer days in the great outdoors that one might expect from a New York City boy. Tracks like “Six Times,” “Meadowport Arch” and “The Swimmer” are designed not just to give listeners a summery feeling, but to transport them to a carefree earlier era, as imagined by classic TV and Top 40 radio. The Albemarle Sound isn’t about making soullessly precise models of ’60s pop tunes by Petula Clark and The Association; neither is the sound a kitschy joke, nor used for darkly ironic effect. The band crawls inside this music and illuminates it from within, pointing out lively new high spots and bringing real weight to potentially feather-light ideas. Where not to start: What’s this? An E6 supergroup featuring uncredited (and unconfirmed) participation by Jeff Mangum, Julian Koster, Kevin Barnes, Robert Schneider, Andrew Reiger, and Will Cullen Hart? That would seem to be the ideal place for any E6 novice to begin, yes? Not so fast. The Major Organ And The Adding Machine project—which thus far has included a tuneless, cacophonous self-titled 2001 album and a goofy 2008 movie—represents the collective’s worst traits, valuing self-satisfied dicking around over coherence or trying to connect with an audience. Everyone involved with Major Organ looks and sounds like they’re having fun, but strictly in a “you had to be there” kind of way. Listen to The A.V. Club's Elephant 6 Spotify playlist here.